In its continuing efforts to anticipate our every thought and whim, Costco now carries a wedding cake made out of cheese. 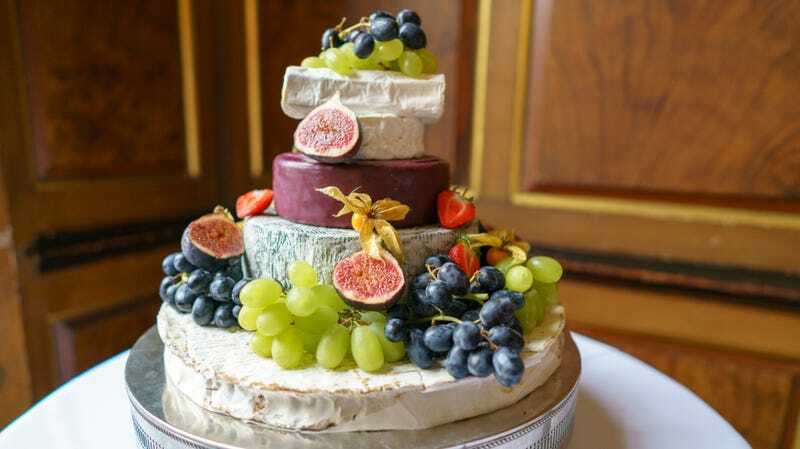 The “Sid Wainer & Son Cheese Lover Artisan Wedding Cake,” to be specific, hosts five full layers of delectable dairy goodness for the carb-hating, sugar-avoiding, cheese-loving happy couple and their guests. Those five sumptuous layers each deserve their own detailed descriptions, helpfully provided on the Costco website: 8 pounds of Red Leicester (“Ground annatto seeds are added to create a deep russet red color and a marvelous experience to this farmstead pasteurized cow’s milk cheese”), 7 pounds of Danish Blue (“mild bleu cheese flavor but striking green and blue veins throughout and a crumbly texture”), 5 pounds of Murcia Al Vino (“an intensely flavorful cheese that is then dried and immersed in local Murcia wine”), 3 pounds of Tuscan Sheep’s Cheese (“clay-like aroma, smooth, even rind with a semi-firm texture, and slightly sharp, but nutty taste that improves with age”) and just over a pound of Brillat Savarin Triple Cream Brie (“luscious triple cream brie from the Normandy region of France has a soft, velvety texture and creamy flavor”), all stacked into an appetizing tower. The price for 24 pounds of heavenly cheese is $439.99, which Costco estimates could serve 105 to 150 people. By my math, 24 pounds = 384 ounces, so just under 4 ounces of cheese apiece for 100 people. This seems low, but I can polish off a quarter-pound of cheese pretty easily. Maybe too easily. Your tower isn’t automatically going to look as nice as the floral-draped picture on the website, though; you’ll have to add your own cheese tree cake decorations. Still- I’m married already, but I could throw a big party for my anniversary this year and serve this, right? BYO crackers.